Every day, your brain maintains a delicate balance between chemicals that push its cells to fire and opposing chemicals that pull its cells back toward inactivity. Two of the most common neurochemicals that play this tug of war are glutamate and GABA, both of which are neurotransmitters, chemical messengers that communicate between neighboring brain cells. The purpose of glutamate is to elicit action, while the function of the GABA neurotransmitter is to restore calm. You can think of glutamate as a personal trainer, urging your neurons (brain cells) to do more and go faster. GABA on the other hand, acts more like a parent at nap time, trying to lull your neurons into rest. GABA (gamma-aminobutyric acid) is a common neurotransmitter that affects many aspects of health, especially emotional and physical stability. Like a parent turning off a light switch at nap time, it regulates and restricts neuroelectric activity. Without GABA, electrical impulses could run out of control in the brain, resulting in seizures. A primary function of GABA is to subdue anxiety. During pain, fear or stress, certain groups of neurons can become hyperactive, firing too frequently. 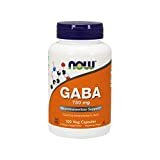 GABA steps in to wipe away the tears and fears, soothing neurons to a lower state of stimulation and promoting a feeling of calm and relaxation. Of course, you are never more calm and relaxed than when you are sleeping, and sleep is one of GABA’s foremost priorities. As GABA moves through the network of cells in your brain, it’s as if it is singing a lullaby to each neuron. When animals hibernate, their GABA levels spike. Even non-hibernating animals like humans experience increased GABA levels during sleep. Deep in the brain, there is a cluster of cells called the VLPO (ventrolateral preoptic nucleus), otherwise known as the “sleep switch.” About 80% of the cells in the VLPO specialize in GABA transmission. The sleep switch, much like that parent turning off the light, starts the cascade of events that initiates sleep. Also, just as a parent might set the household’s bedtime and wind the alarm clock, GABA is involved in maintaining the internal body clock that sets circadian rhythms. Of course, sleep itself is a key player in the maintenance of health. Studies have shown, for example, that sleep deprivation impairs immune function. When scientists exposed a roomful of people to a virus, the ones who were well-rested were better able to fight if off than the ones who were tired. Growth hormone, which is essential for building and repairing the body, surges during deep sleep. So do cytokines, proteins that appear to protect against inflammation. So GABA facilitates all of these functions, through its facilitation of sound sleep. GABA also appears to play a role in female reproductive functions, perhaps because hormonal cycles may sync with the body clock. Finally, GABA has a hand in learning and memory. It is prominent in regions of the brain like the hippocampus, which is known to be involved in memory formation. And research suggests it helps the brain reshape its neural connections. However, its role is not simple; contradictory evidence suggests that GABA both helps and harms the formation of memories. What Happens When There’s Too Much GABA? Since GABA acts chiefly as a relaxant, too much of it may cause excessive drowsiness. In fact, some sedatives, such as Valium and alcohol, work by enhancing the effects of GABA in the brain. They bind to the GABA receptors in neurons, amplifying its tranquilizing effects. However, some people paradoxically experience the opposite effect. They may feel unexpectedly anxious, or even panicky. When GABA levels are too high, it can also bring on uncomfortable physical side effects. People have described tingling sensations, or feeling flushed or short of breath. Blood pressure and heart rate may change. Because GABA is so heavily involved with the sleep-wake system, excess GABA could also induce unpleasant sleep disorders. Drugs that mimic GABA can trigger sleep paralysis, a disturbing state of consciousness brought on by a mismatch of sleep stages. In sleep paralysis, the brain “wakes up” during the muscle paralysis that is the hallmark of REM sleep. The person feels trapped inside their body, unable to move to get out of bed. Also, hyperactive GABA receptors have been associated with narcolepsy, a rare but serious disorder of excessive sleepiness. There is a relationship between high GABA levels and depression, which makes sense given that GABA typically promotes a calm, relaxed mood. Too much calm, however, turns into indifference and apathy. Recent research links Alzheimer’s disorder with excessive GABA. An overgrowth of star-shaped cells called astrocytes, coupled with an over-abundance of GABA hushing neural activity, serves to block action in parts of the brain involved in learning and memory. What Happens When There’s Too Little GABA? GABA deficits usually stir up feelings of stress and anxiety. Without GABA to inhibit its action, glutamate goes into overdrive, spurring too much electrical excitation in the brain. A person with low GABA levels may be irritable, or they might seem nervous and fidgety. They might speak quickly, and may report difficulty thinking or concentrating. The quality of sleep almost always suffers when GABA levels are too low, insomnia being a common complaint. Sleep is lighter and more interrupted, and there is a smaller proportion of slow wave sleep. Slow wave sleep is important, not just because it subjectively feels deeper and more refreshing, but also because it plays a significant role in immune function, growth and physical repair of muscles and tissues. Low GABA may also be responsible for mood imbalance. Depression is one possibility, but low GABA levels may also trigger other disorders such as bipolar mania. One study found that people with panic disorder had 22 percent less GABA than average. And individuals who have undergone trauma are much more likely to develop post-traumatic stress disorder (PTSD) if their GABA level is low. There is increasing evidence that many neuropsychiatric disorders, including autism and schizophrenia, may be outward signs of underlying problems in the glutamate-GABA system. Of course, the psychological impact of a GABA shortage could be more subtle; there is also a link between GABA deficit and poor impulse control. On a physical level, lack of GABA sets the stage for muscular dysfunctions such as excessive muscle contractions (myoclonus). Heightened electrical activity can cause muscle fibers to fire out of control, resulting in muscular jerks or twitches. Relatively recently, researchers also connected GABA to Parkinson’s disease, previously categorized as a disorder of a different neurotransmitter, dopamine. Now it appears that Parkinson’s-induced involuntary movements (dyskinesias) are actually due to GABA deficits. Of course, when neural activity runs out of control without enough GABA to diminish it, the worst case scenario would be a full-blown seizure. Several companies manufacture GABA through a dairy fermentation process using lactobacillus, which is the same bacteria found in yogurt and some cheeses. These companies produce oral supplements — capsules, tablets, and powders — that contain the cultivated GABA. Do these supplements work? We do not have a definitive scientific answer yet. A quick check of online product reviews reveals mixed results among users. There are hundreds of positive reviews, with people reporting better sleep, lower anxiety and better mood after taking the supplements. This seems logical; if there is more GABA in the body, then it should counteract the stimulating effects of glutamate and produce a calming effect. But other online users said they did not notice any effect. Why not? One possible reason might be that the harvested GABA was unable to pass through the blood-brain barrier (BBB). The BBB is a tight layer of thickly-sheathed blood vessels that protects the brain. It is like a firewall, filtering out substances that could harm the brain or thrdow it off balance. There is conflicting evidence about whether the GABA in supplements can cross the BBB. Even if it cannot, companies that produce the supplements say it is possible the GABA could be picked up by similar receptors in the gut. If so, the vagus nerve could transmit GABA’s influence up the spinal cord and into the core of the brain, bypassing the BBB altogether. Another way to circumvent the BBB might be to take a GABA precursor or potentiator. These substances do cross the BBB, and may then be converted into GABA once they are on the other side. Small studies suggest that GABA supplements may boost levels of growth hormone (GH) when taken by bodybuilders before workouts. In theory, extra GH could help restructure muscles and fat cells. However, it is not known whether the supplements would have the same effect on sedentary people with a lower level of physical fitness. As a side note, people who use GABA supplements should avoid alcohol and other sedating medications due to a danger of over-sedation. The supplements are not recommended for women who are pregnant, or for anyone with a significant mood disorder such as bipolar disorder. Some studies have suggested that it may be possible to boost GABA levels without drugs or supplements. One possible route may be exercise, and yoga may be particularly effective. A small study of yoga practitioners found that yoga increased GABA in the brain by 27 percent. The thing about yoga is that it is a discipline of the mind as well as the body. Some studies have shown that meditation alone may also boost GABA or at least markers of GABA activity. In a famous experiment from the 1970’s, 70-year-old Yogi Satyamurti was able to induce a hibernation-like state through deep meditation for eight days in a sealed underground pit. Perhaps he was able to produce extra GABA through the process of meditation. Dietary adjustments might also raise GABA levels. Since it is a byproduct of the fermentation process, fermented foods like yogurt, kimchi and sauerkraut may increase GABA without the need for a supplement. Your body cannot make GABA without Vitamin B6, so it might also be helpful to increase B6 by eating foods like raw pumpkin or sunflower seeds, pistachio nuts, sweet potatoes, potatoes, spinach, bananas, lean meats and fish. Some websites steer people toward eating foods that increase glutamate. However, the value of that strategy seems questionable. While it is true that the brain builds GABA from glutamate, the overall goal is to change the balance of GABA and glutamate in favor of GABA, so boosting glutamate could actually be detrimental. In the end, balance is the true goal. Modern life with its many stressors may tend to throw the glutamate-GABA system off track so that we live in a world of chronic GABA deprivation. It may be beneficial to try to tip the balance the other direction to maintain a healthier lifestyle.